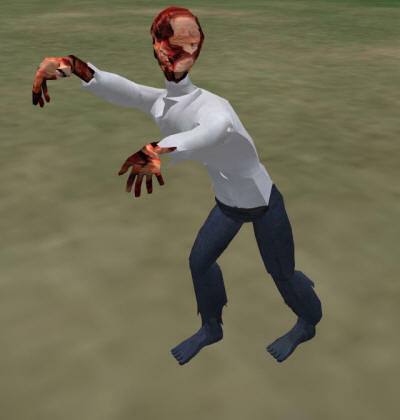 This animated script makes a zombie walk around waving his arms and it makes it fall apart when you click it to death. You can ride the zombie and kill it over and over again. This system works in Second Life only (not OpenSim). This Zombie is based upon a build by Eric90MX. 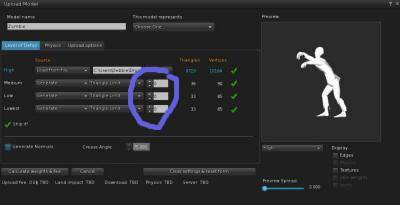 You can set the Level of Detail (LOD) to all zeros to get the minimum number of prims possible. Add a single cube prim under the zombie, make it flat and wide, and set the Shape to Prim and the Type to GLASS (glass has lowest friction ). 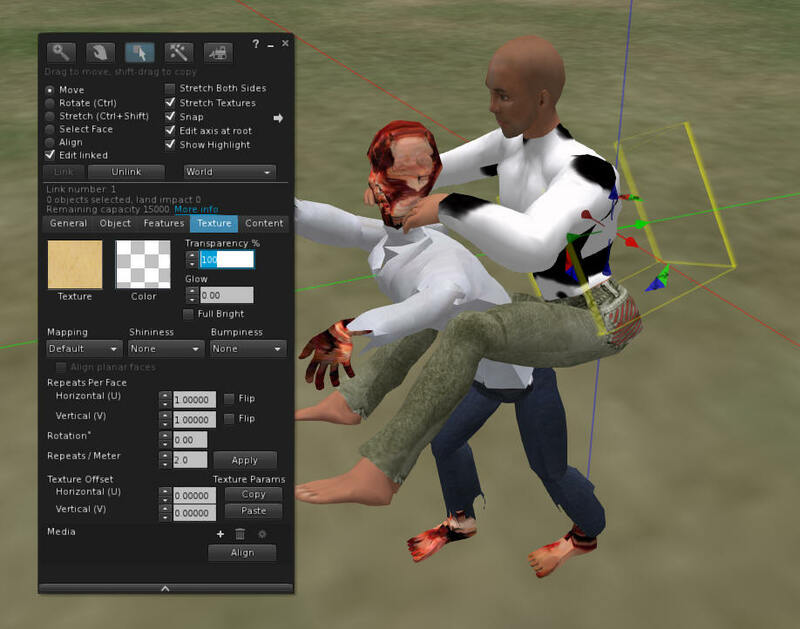 This zombie uses two scripts from my Prim Animation Compiler project. You will need to get those two scripts and add them to the zombie base. die fall to pieces - scatter all the prims around on the ground. The sequence you will use is to click the zombie to get a menu. 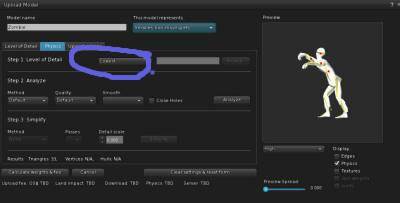 Then Click NAME, type in the name "stand", move the prims so the zombie is standing, then click RECORD. Click NAME again, type in "attack", and move the zombie where it appears to be trying to grab you. Click RECORD. 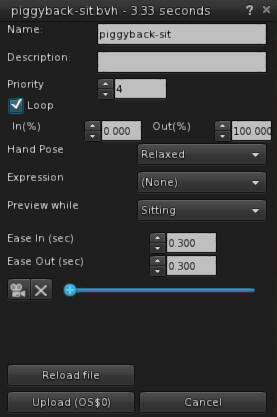 Repeat until you have recorded all the above animations. When done, click COMPILE, and copy and paste the output into a new script. Search and Replace the Date and Time stamps, and save it. Follow the instructions in the Compiler article for more details. Add one more prim near the back of the zombie. Do not link it, we will need to adjust it first. 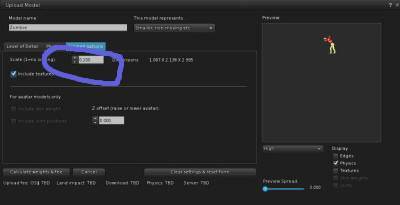 These are the settings for the upload: Priority should be 4 so it overrides your AO, and it should have looped checked. Now that you have the script and animation in the prim, right click and sit on the prim by selecting RIDE ME. 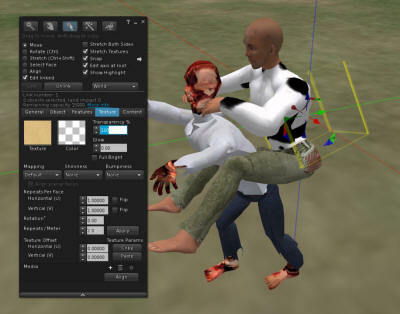 Position the prim behind the zombie so that you appear to be riding it. When you have it correctly positioned, hop off, select the prim and then the zombie last,. and press Ctrl-L to link them. Now its time to ride! Add the zombie script to the base of the zombie. // Animated wandering rideable zombie script. //  Sets Home point where rezzed. //  Will drive around like a vehicle so it works on most surfaces. The zombie should start to move around. Click the zombie to set the distance it is allowed to roam. Have someone click the zombie. It should animate each time they click it. If they click it enough, it should fall apart, then re-assemble itself. Now right click the zombie and select RIDE ME. You should be able to drive the zombie around. When you hop off, it will fall apart, reassemble iteself and then walk back home.